The Australian Gold Kangaroo is ranked amongst the best buys on the bullion market. Boasting a purity of 99.99% gold, these world-class coins are limited edition issues and annually changing designs. The Kangaroo is therefore an attractive collector’s item which forms part of a tradition dating back to 1986. The unique designs feature the loveable Red Kangaroo in its natural habitats and is one of the most aesthetical adorable coins on the bullion market. 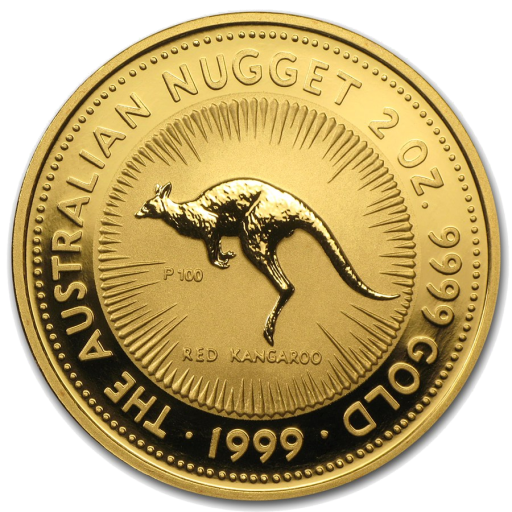 Recognized all over the world as a profitable investment, the Australian nugget Kangaroo has a high liquidity value. Why buy 2oz Australian Kangaroo coins? The 2 oz Australian Kangaroo is the heaviest investment coin of its kind, thus much more valuable than lower denominations. Crafted to the highest standards of engineering, the exquisite design and low mintages make these coins highly sought after, promising early adopters an excellent return on investment. Gold always performs well in times of economic crises and goes down when the markets are safe. Therefore gold always proves to be a profit if you buy and sell at the right times. It comes as no surprise then that gold has been the safe haven go-to investment for centuries. With this in mind, investors need to decide which gold coins will make the most profit and the 2oz Kangaroo gold coins can certainly lay claim as one of the most valuable investments on the bullion market. Furthermore, when you buy the 2 oz gold Kangaroo from our mixed years collection, we cannot guarantee what year the coin was struck – thus adding to the excitement of the surprise when you receive your order. However, if you are looking for a specific year, contact a member of our friendly staff at sales@coininvest.com. The Australian Gold Kangaroo coin is defined by the distinctive portrait of the Red Kangaroo are instantly recognizable for the image of the Red Kangaroo on the reverse. The reverse design changes every year so that collectors can admire an entire selection of different images. The coins are struck in the Perth Mint, indicated by the letter “P” – the mintmark of the refinery. The year and purity also feature on the reverse. On the obverse side is the profile of Queen Elizabeth II together with the country the coins were manufactured. Australian Nuggets first made an appearance in 1986. The design featured a nugget – hence the name. However, it was deemed that the nugget did not symbolize Australia with an image they are uniquely associated with. The Red Kangaroo was therefore introduced in 1990 and became known as the kangaroo. The Perth Mint is a leader in minting techniques and has a worldwide reputation for producing coins of the highest quality. The Mint takes particular measures to insure the coins against counterfeiting by using the latest technologies and precise dimensions that make the gold Kangaroo impossible to counterfeit without escaping the attention of experienced practitioners like the experts at CoinInvest. Buying the 2 oz gold Kangaroo online could not be easier on CoinInvest. Simply select the number of coins you would like to purchase and add your choice the shopping basket using the fields to the right of the image above. All you need to do then is tell us which country you would like your purchase shipping to and proceed to check-out or continue browsing our online store. If you have any 2 oz or 1 oz Australian Kangaroo coins for sale, contact a member of our staff for a price. As a leading bullion dealer in Europe, we offer highly competitive prices in relation to current market value.